Today, I'd like to welcome the Harlequin Naughty or Nice Blog Tour to In the Hammock! 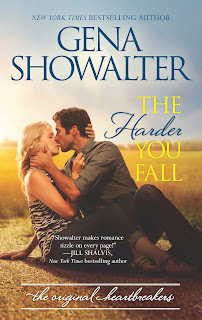 I'm featuring a recipe from author Gena Showalter along with a tour-wide giveaway!! going to eat way too much. But your taste buds will thank you. Preheat oven to 375ºF (190ºC). Butter a 13 × 9 inch pan. Combine the flour, cornmeal, baking powder, salt and sugar, and mix well. incorporated. Pour into prepared pan. oregano, thyme, basil and bay leaves. 5 minutes more. Crumble the cornbread into the skillet and mix then remove pan from heat. Thanks so much for stopping by and sharing your recipe, Gena!! This sounds so yummy!! Now for the tour-wide giveaway!!! Giveaway and Rafflecopter are run by Kismet Tours and Harlequin. In the Hammock does not control the giveaway, entry information, or prizing.